Fate/Tiger Colosseum was released on 13/09/07. Even you figure in shipment times and the time I’d need to invest into playing it enough to formulate something like a valid opinion on it, I should really really have been posting about this almost two months ago. So, this post is pretty old news by this point. Actually, now that I sit down to think about actually writing about the game, I’m not really sure there’s much to say about it. In game terms, it’s a fairly light-weight Powerstone-esque arena based fighting game – up to four fighters shoved into an arena, energy bars which deplete when attacked, some collectables for healing and temporary power-ups, an item allowing a one-off special attack and a few gimmicks spread across the stage. The attacks aren’t particularly special – there are two attack buttons, but they are basically independent – there’s the main attack button you’ll end up hammering, and a guard-break you’ll never touch. There’s an attack you can use clear opponents from around you if surrounded, and most characters have a couple of Noble Phantasm attacks, which do Massive Damage, which can be used assuming you have enough mana stocked up and are holding the Tiger Ball item. Based on the attack styles, there’s basically two types of characters – the melee types like Saber, Archer and Shirou, and the ranged types like Rin and Kirei. The later type are a pain to play as, as you pretty much spend all your time running away, shooting, running away some more, shooting some more, etc, etc. The stage based gimmicks aren’t really very exciting – there’s nothing really elaborate like in Powerstone. Mostly, it’s teleport-like features, allowing you to jump from one part of the stage to another. One stage has a tall building, up which you can’t do a really big jump, allowing you to take battle to the air for a while, but that’s about it. 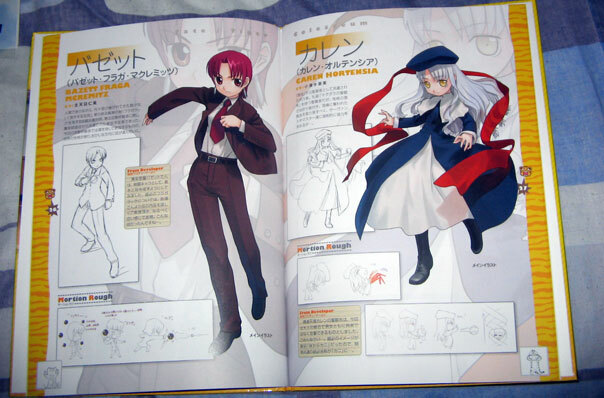 the actual stages are based around sites familiar with Fate fans – Shirous courtyard, Illyas mansion, the stairs leading up to the shrine and the like. The individual stage design is reasonable enough for the most part, although there’s a few which are a little flat, and all of them could be improved with a little interactivity. As far as the power-ups go, there’s nothing exciting like weapons or anything, it’s all temporary stat-boosts for you attacking, speed and jumping abilities, healing items for your health and mana, plus the aforementioned Tiger Ball. Where the game differs a little from other games of the style are the victory conditions. Whilst the game does have the standard last-man-standing style games, plus a capture-the-flag style mode where winning is based upon holding on for the Tiger Ball for longer than the opponents, most of the time you’ll find the story mode throws out points based victory conditions. Each playable character in the game as a number of points associated with them – the stronger characters like Gilgamesh are worth more than the weaker one like Sakura. Berserker is worth way more than any other character, not because he’s strong (he’s comparatively weak), but in lieu of a Noble Phantasm attack he has to be killed twelve times to score from him. Shinji, coincidently, is worth a just a single point, simply because it’s funny – infact, Shinjis whole story-mode campaign is based around the Capture-the-flag type stages, meaning you spend the whole thing running away. Getting back to how the points come into play, most of the games story modes are made up of stages where either you have to score more points than your opponents team within a timelimit, or race to get a fixed number of points before one of your opponents do. It doesn’t really make much difference which of those two you have, and to be honest the traditional, last-man-standing games tend to be a little more interesting to play, as you either end up with way more points than your opponent and wait around bored, or you just mash and hope you kill more of them then they kill of you. At least with the last-man-standing stuff you have to be a little careful. Ultimately, as an actual game to play, it’s hard to recommend when theres a much better Powerstone-esque title on the system – it’s called Powerstone. That said, if your Japanese is up to it, the story mode is just about enough to make the game worthwhile. Each of the playable characters (and there’s quite a few, though many need unlocked) have their own, very tongue-in-cheek story game to play through. Sure, it’s just text boxes and small portraits, with a CG at the end, but it is fully voiced. My Japanese isn’t really up to the task, but what I could gather of it was pretty amusing. Also, the SD art is cute. I, of course, bought the LE version of the game. It came in a big box with the bunch of tat shown below. 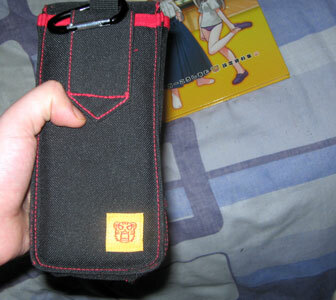 I actually use the PSP case – it’s quite nice. 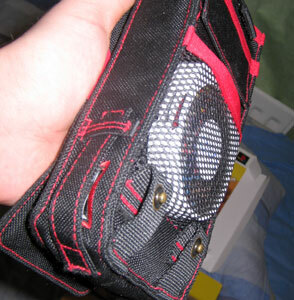 It has a couple of small pockets for memory sticks, a net pouch into which you can squeeze around three UMD disks and a little flap on the side you can pull down to get access to the recharging socket without removing the console. It’s decorated in an attractive yet subtle Fate style with the image of Shirous command seal on one side, and a little Tiger pouch on the other. The CD is a drama CD. I can’t say I’ve listened to it. 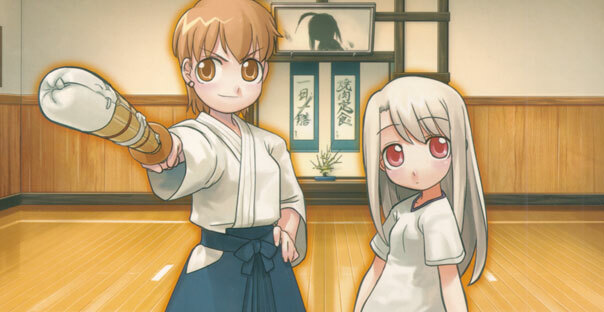 The two posters are, well, clear posters – those things printed on transparent plastic which don’t look quite right without being placed onto a white background, and feature Rin, Saber and Sakura in the new costumes designed for this game. 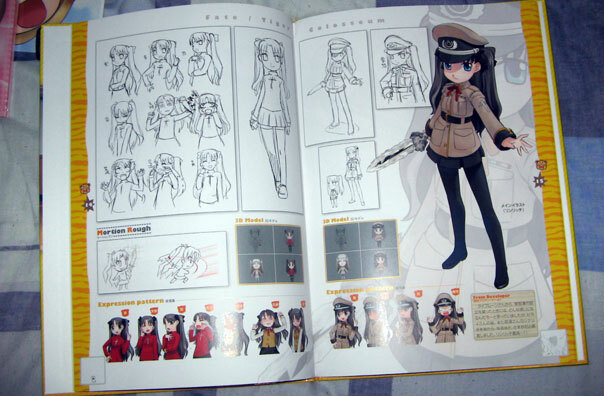 The book is nice – it’s a hardback, about fifty pages long and features the usual mix of colour art, design sketches, a short manga and, best of all, a flip-book animation printed on the bottom of the pages. 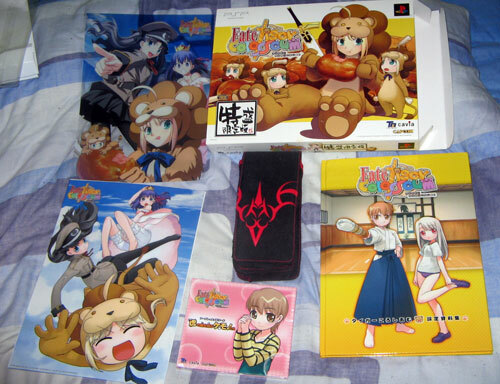 The LE extras are almost worth picking the LE version of the game up for if you need a decent PSP pouch and can find interest in at least one of the other items – there’s still stock of the LE floating around thanks to there being an Asian version of the LE as well as the original Japanese release, so it’s not like its unobtainable. (*) I’m making reference to gaming radio show/podcast One Life Left, where they always score games as 7/10. From what I gather, it’s the least incendiary grade you can give a game in a review – it’s low enough to look like a bad game, but high enough not to annoy publishers. heh, having played a bit of this game a couple of months ago, have to say i was disappointed w/ it. but that wasn’t any surprise from the trailers and knowing cavia developed it. cool pics of the le as the le swag does look sweet. recommended game for the type moon/fate fan, otherwise shat. i would’ve given this game 4.5/10 in general. however the le edition would bump the score up a bit imo, maybe to a 6 ^^. hey has anyone else played it? i thought it was cute, but i need help. i have no idea how to read japanese so i dont know where story mode is and i dont know how to unlock new characters. umm, if anyone has a game save, could they please upload it somewhere? like gamefaqs?